I won’t be shy in admitting that my BOMA/Chicago presidency has numerous perks. I always get a speaking role at events, which I’m very comfortable with because it’s something I’ve enjoyed doing throughout my career. I also get to sit at a table near the front of the room where I can watch and listen to many tremendous presentations. But there is one perk to my presidency that stands out among the rest – that I am able to play an active role in events that give our members information they will use to succeed and provide a format for them to interact with industry colleagues. And that’s exactly what I did at the June 11 Mid-Year Market Review Program Lunch. 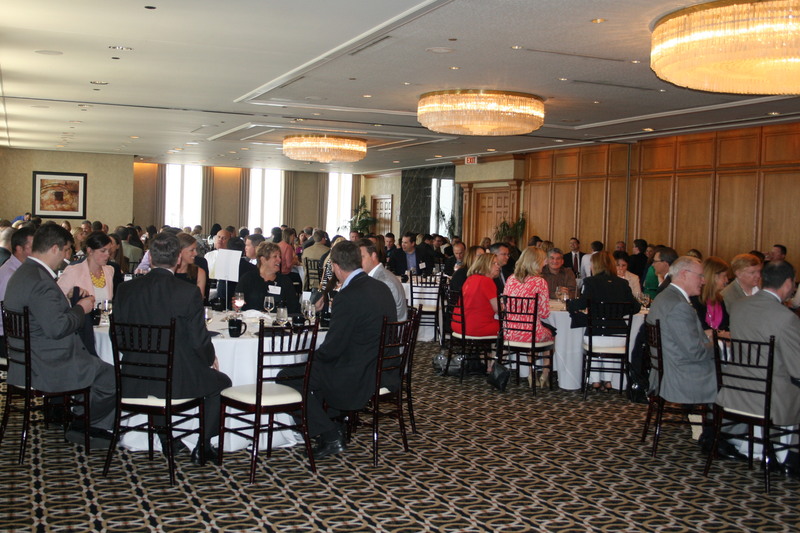 All 160 attendees at the June 11 Program Lunch. Before the panel kicked off, I watched as 160 of you networked, laughed and caught up with commercial real estate friends. The Mid-America Club bustled with as much energy as the outside view we had from 80 stories above Lake Michigan and Grant Park. Seeing your engagement with each other and a panel topic that is relevant to all of your jobs brings value to my presidency and shows me that BOMA/Chicago is meeting its core values to give you all a space to network and learn. And I have no doubt that each of you learned more than you bargained for as each of the panelists informed us about the current and changing state of the CRE industry. 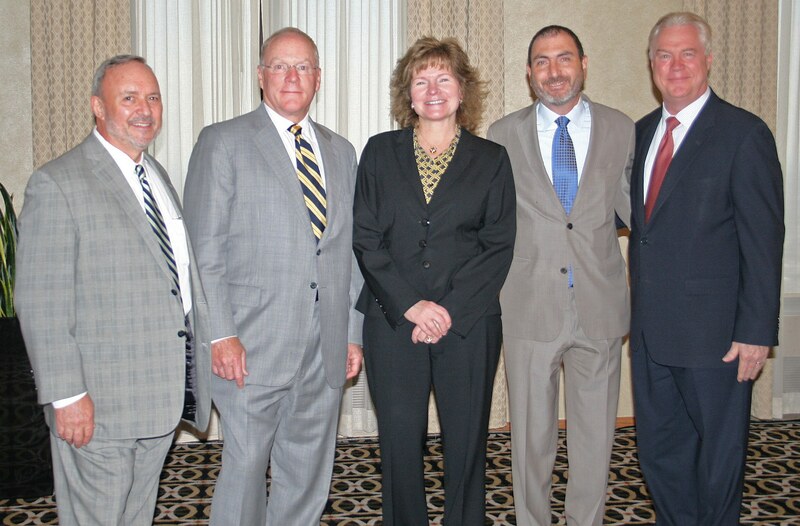 Our expert panelists, from left to right: Michael Cornicelli, Bob Chodos, Maureen Ehrenberg, Bruce Miller, George Kohl. Michael Cornicelli, EVP of BOMA/Chicago, discussed data from the Economic Impact Study, such as how BOMA/Chicago member buildings contribute $3.5 billion to the Illinois economy and that overall demographics are trending in the right direction. Bob Chodos, Principal at Colliers International, noted that that although 12 major corporations have recently moved their offices downtown, the current trends of telecommuting and hoteling are slowing positive absorption of vacant space. Maureen Ehrenberg, Executive Managing Director of Global Facilities at CBRE, informed us that downtown companies are wary of the future and remain apprehensive about office and employee costs. Bruce Miller, International Director of Jones Lang LaSalle, ended the expert panel on an upbeat note with data showing that office sales are increasing, with more than $3 billion in investment sales transactions anticipated this year. 1) Downtown Chicago building owners and managers innately value sustainability. Even without potential legislation that is meant to enforce sustainability, BOMA/Chicago members routinely adopt energy sensitive policies for their own buildings because they value the environment and efficiency. 2) We are changing with the times. With the ever-increasing use of technology, businesses can frequently function without the live presence of their staffs. People can work from anywhere and BOMA/Chicago members are preparing for the fact that corporations and professional firms are using space creatively and more judiciously than ever before. 3) Global investors are interested in purchasing our buildings and we take pride in the fact that downtown Chicago has become a very desirable international acquisition target. 4) Compared to other major markets, Chicago has a disproportionate amount of young, educated vibrant workers and this has made it an attractive location for global businesses of all types. As this upcoming Sunday marks the middle of 2013, the question is now how you can apply these takeaways to your jobs to be more successful for the rest of the year and beyond. My advice to you is this – use the knowledge our expert panelists shared to analyze your own buildings. Create a plan and budget for modifications that will better align your properties with the needs of current tenants and future buyers. Do not focus as much on what was important in the past. Instead, think like a futurist and prepare for the upcoming demands of the diverse audiences you serve. 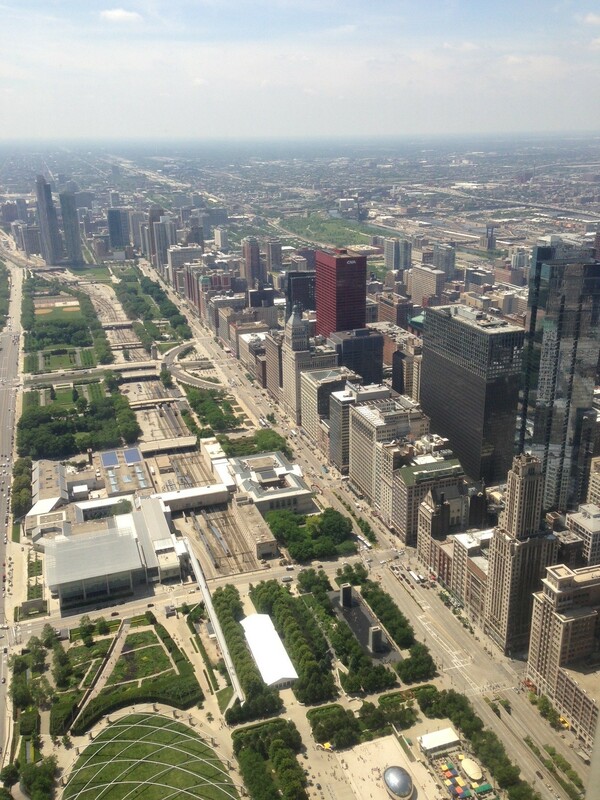 View from 80 stories high at the Aon Center. I would also like to report that the Mid-Year Market Review was not only well received among BOMA/Chicago members. Numerous local news outlets attended the June Luncheon to report on what our expert members had to say about the industry. Click on the links below to read the news articles on the Mid-Year Market Review, all of which proudly demonstrate that with the help of you and our panelists, we once again proved that we are the voice of Chicago’s downtown office building industry. Lastly, I would like to thank our panelists and each of you who attended. Now, it’s up to you to be an active part of realizing all of the potential our great city has. This entry was posted in BOMA/Chicago Events, Chicago CRE Industry, Chicago Events, Chicago News, CRE Trends, Green, Property Management, Tenant Relations, Uncategorized and tagged Bisnow, Bob Chodos, BOMA/Chicago, Bruce Miller, CBRE, Economic Impact Study, Globe St., Jones Lang LaSalle, Maureen Ehrenberg, meeting its core values, Michael Cornicelli, Mid-America Club, Mid-Year Market Review, RE Journals. Bookmark the permalink.